Tis’ the season for retrospectives, stories cataloguing the highs and lows of the year. This year’s added bonus is stories looking back over the decade. While I firmly believe in Santayana’s maxim that “those who cannot remember the past are condemned to repeat it,” most “year in review” or “decade in review” stories are essentially empty calories, little more than recitations of occurrences. My preference is for stories that try to connect those occurrences in such a way that trends emerge, providing a sense of what the future may hold. That’s what I hope to do today; let’s start by figuring out where we are and how we got here. Until last year’s financial collapse, Jackson Hole’s economy during the twenty-aughts was essentially a continuation of its economy during the 1990s. Until around 1988, our economy was driven by tourism. Following a four-year pupal stage, we emerged as a community which, while continuing to believe it was a tourist town, was actually something different; a community whose economy was driven by lifestyle. Graphs 1 and 2 show this shift. Graph 1 compares how the U.S. and Teton County earned their income between 1970 and 2007 (the most recent data available). In it, each line represents a measure of Teton County’s income divided by that of the nation: The purple line is per capita income; the black line is investment income as a proportion of total income; the green line is tourism-driven income (retail, restaurants, and lodging) as a proportion of total income. The take-away is how flat all three lines were during the 1970s and 1980s. This is because, during those two decades, the changes affecting Jackson Hole were not much different than the changes affecting the nation. In the four years between 1988 and 1992, however, Jackson Hole began changing much faster and more dramatically than the United States as a whole, a pattern which continues today. The net result was our current economy, one which took hold in the early 1990s and crested in 2008. As Graph 2 suggests, this is an economy driven not by tourists, but by people of means who can live anywhere, and choose Jackson Hole. With their money came the rise of our lifestyle economy. • Wyoming’s lack of income tax (which tipped the balance for economically-driven zillionaires looking to relocate to a resort community). By 2000, these patterns had been in place for nearly a decade; during the twenty-aughts, they became more dialed in. As they did, the valley’s demographics shifted with similar force. Those who relied exclusively on income earned in Jackson Hole found it harder to live here; as lower-income workers were forced out, our Latino population boomed. Those displaced from Jackson Hole flocked to the Star Valley and, especially, to Teton Valley, Idaho, and developers rushed to duplicate Jackson Hole’s real estate patterns in the surrounding communities. So that’s where things were until about 18 months ago. For three reasons, however, while the twenty-teens will build upon what’s happened the past 20 years, this coming decade is going to be different than the past two. The first reason is the economic meltdown. With it came a new, more conservative approach to lending, and it will be a long time before credit becomes as loose as it was. As a result, it will be a long time before we return to the consumption patterns of the last decade or so. This, in turn, will mean lower prices and slower growth. A further result is that many of the investments made during the last three to five years will never pay off. Until those out-of-whack pro formas and balance sheets get cleaned up, Jackson Hole’s economy is going to drag, and the economies in surrounding communities will suffer even more. This leads into the second reason the twenty-teens will be different: the just-getting-started collapse of our previously vibrant construction economy. Between high demand, easy credit, and a relative abundance of land, the last 20 years has seen a huge amount of construction, and with it the growth of a large, talented, and successful building trade. Yet of the three factors that produced the rise of this trade, only high demand remains. Not only will tighter credit markets make it harder to finance everything from home purchases to development projects, but Jackson Hole is essentially running out of developable land: at the rate we’ve been developing land, we’re down to about a 10-year supply of raw land. After that, it’s basically in-fill and re-development. Combined with the slowdown in consumption, this slowdown in construction means that the economy of the twenty-teens will have a different feel than the one we’ve known the last two decades. Since 1990 or so, our economy has had three legs: investment income and professional services, activities related to tourism, and construction. All three were boosted by relatively easy credit and an ethic of conspicuous consumption; all three will continue, but not to the same degree of excess we’ve known. As a result, the economy of the twenty-teens will be more modest, focusing on quality more than quantity. Successful businesses and economies will be those which provide consumers with not only a great deal of choice, but – and this is the most important point – true and lasting value. Fortunately, Jackson Hole is well-positioned to provide that, for our environmental quality gives us a true distinction, and therefore a true competitive edge. However, our success in this new, humbler economy is not guaranteed – we’ll have to earn it by first letting go of the consumption-driven mentality we’ve embraced over the last two decades. This reality leads into the third reason the twenty-teens will be different than the last two: the coming imperative of sustainability. Big picture, there are two reasons Jackson Hole will continue to grow and thrive. One is that population will continue to grow, and all those folks will have to live somewhere. The second reason is that, no matter how badly we screw ourselves up, our public lands guarantee that our environment will continue to be healthier than most other places’. This, in turn, will continue to make us attractive. As a result, we’ll continue to hold the aforementioned competitive advantage over most places, which will continue to make us a reasonably solid investment. What’s not at all clear, however, is how readily we’ll transition to the new, humbler economic reality. If we act quickly and decisively to embrace this reality, in 2020 we’ll look back and say that the most significant trend of the twenty-aughts was the emergence of a sustainability ethic, one which came into full flower in the twenty-teens. However, I can also envision a scenario where, over the next several years, we’ll go into a state of denial, and channel our collective energies not into embracing the future, but into trying to re-create the past. If we go this route, the cause will be the very real economic concerns facing many of us – the retail and building trades, the investors and high-end tourism folks – who, after years of doing well, face significant hardships today. These folks will no doubt turn to local government for help, urging measures ranging from loosening land-use regulations to devoting large amounts of public funding to stimulating the tourism economy. These measures won’t really work, for underlying both our boom and bust have been macroeconomic factors not susceptible to local economic development efforts. But that reality won’t matter much to people struggling economically, and they’ll likely support candidates in the 2010 and 2012 elections who position themselves as “pro-growth.” This, in turn, will create a minor class war between the well-to-do and those who are struggling. And this is where sustainability is the key. The great challenge facing Jackson Hole in the next decade is to figure out what true sustainability means, and then find the courage to act on that knowledge. To do so will require all of us to act differently, to leave things on the table, to compromise in an era marked by increasing polarization. Dyed-in-the-wool environmentalists will have to recognize that economic health is part of true sustainability, for a true community consists of more than just independently wealthy individuals serviced by people commuting from the ‘burbs. Similarly, dyed-in-the-wool free-marketeers will have to realize the great lesson of the financial meltdown of 2008: Unregulated markets invariably collapse under the weight of their own greed. By extension, if we don’t pay close attention to our environmental health – again, the only thing that truly distinguishes us from every other similar town in the world – then we’ll not only ruin our environment, but the economy which lies on top of it. The opportunity at hand is that no one has figured out what true sustainability really means, much less how to do it. Things were similar 20 years ago, at the dawn of the lifestyle economy era. Jackson Hole was well-positioned then to take advantage of that trend; it’s similarly well-positioned today to take advantage of the emerging sustainability economy. Whether we’ll choose to recognize this is not at all clear; even less clear is whether we’ll choose to act on it. If we do, though, we can look forward to a period every bit as successful in its way as the last 20 years have been in theirs. Surveys of watersheds in Teton County and on the Bridger-Teton National Forest found no new populations of invasive aquatic species this year. A coalition of partners funded the surveys, which were conducted by members of Portland State University’s Center for Lakes and Reservoirs during a two-week period in July and August. The surveys cost roughly $30,000. The technicians looked for non-native species such as New Zealand mud snails, zebra and quagga mussels, Eurasian watermilfoil and saltcedar, which can outcompete native species or clog waterways. Jeanette Langston, lead river ranger for the Bridger-Teton, said fortune may have helped keep invasive species at bay given the number of out-of-area users attracted to the region. The key to keeping unwanted invaders away is teaching people to keep their gear clean, she said. “I think it’s just more that we’re lucky right now,” she said, explaining that anglers and boaters are crucial to keeping rivers healthy. “We can’t prevent these without people cleaning their equipment,” she said. Langston said the Snake and the Gros Ventre rivers are especially challenging, because they attract boaters and anglers from across the country. Installations designed to prevent the spread of invasives include six scrub stations on the Snake River and one at the head of the Granite Creek drainage near the Hoback River. The forest also recently purchased a high-pressure washer. Langston is hopeful the forest can hire a seasonal technician who would tow the washer to various boat launches in the Jackson Hole area. Populations of invasive aquatics already exist in the region. For instance, New Zealand mud snails can be found in the Snake River as it runs through the John D. Rockefeller Jr. Memorial Parkway. The main transport for these species is people, especially boaters and anglers using contaminated gear. The partners participating in the survey included the Snake River Fund, Trout Unlimited, the Jackson National Fish Hatchery, the Wyoming Game and Fish Department, the Teton Conservation District, Teton County Weed and Pest, Grand Teton National Park, the Bridger-Teton National Forest and various outfitters. “If we didn’t have all these partners, we wouldn’t have accomplished anything on the forest,” Langston said. While those partners fund and implement a variety of programs designed to prevent the spread of aquatic invasives species, Langston said those measures only go so far. People who are interested in more information about aquatic invasive species can visit cleaninspectdry.com. People who wish to report a possible invasive species population can call 1-877-STOP-ANS. What does the Future Hold for the Teton Watershed? Weblog for the employees, friends and customers of the outdoor clothing company Patagonia. Visit Patagonia.com to see what we do. Thirty-five years ago, biologist and early Wild and Scenic Rivers advocate Frank Craighead, his son Charlie, Patagonia founders Yvon and Malinda Chouinard, photographer Jeff Foote, and others, organized a multi-day paddling and fishing excursion in Teton Canyon. Photographs from their trip were some of the last taken before the canyon was inundated by the ill-fated Teton Dam. The original Teton Dam, authorized by Congress in 1964, was protested on the water and in the courts, but this had little effect on slowing construction. Geology and weather provided a far greater challenge. On the morning of June 5, 1976, as rapidly melting snow filled the reservoir for the first time, water began to gush from the porous rock abutting the sides of the dam. Within hours, the entire structure collapsed. Eleven people perished, entire towns were destroyed, 13,000 head of livestock were killed, and tens of thousands of acres of farmland were stripped of topsoil. Congressman Leo Ryan, chairman of the House subcommittee which held hearings on the disaster, described it as "one of the most colossal and dramatic failures in our national history." [Above, right - Teton Canyon: Rapids formed when the Teton Dam collapsed. These rapids now provide some of the best habitat for Yellowstone cutthroat trout. Teton Canyon, August 2009. 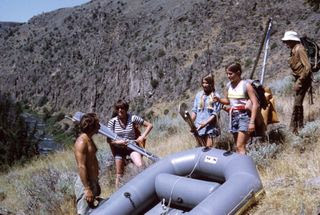 From left to right: in raft, Malinda Chouinard, guide Derek Hutton, Yvon Chouinard; in kayak: FTR Executive Director Lyn Benjamin; in raft, Lisa Rullman, Charlie Ross, Charlie Craighead. Photo: Gabe Rogel. 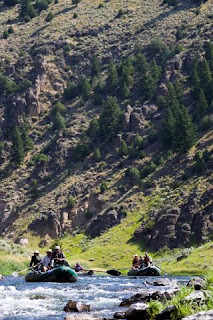 In August 2009, staff and friends of Friends of the Teton River joined Yvon, Malinda, and Charlie as they returned to the Teton Canyon for the first time since 1974. Although Frank Craighead passed in 2001, his spirit touched this trip, which took place on what would have been his 93rd birthday. The purpose of the float was not of celebration of the power of nature to restore itself, nor was it merely one of remembrance. At a time when news about dams is more frequently about removal than construction, the Idaho Department of Water Resources and the Bureau of Reclamation are investigating a rebuild of the Teton Dam. There is a marked contrast between approaches to water management in the lower, previously dammed section of the river versus the upper watershed. 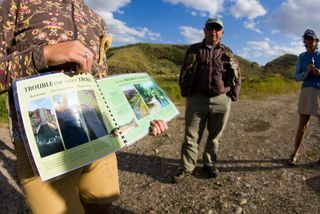 In the upper watershed, Friends of the Teton River has built a 10-year legacy of collaborative, science-based watershed management. Since 2000, we have worked closely with our community, and with local, state, and federal agencies to make great strides in restoring clean water, healthy streams and abundant fisheries in the Teton Watershed, using sound science as our guide. We have found that water can have the power to unite the seemingly divergent interests of irrigators, anglers, developers, policy-makers, and conservation groups. Collaboration allows us to build bridges with our neighbors, and find creative, locally derived solutions that benefit the watershed and the people who live and work within it. Our stakeholder-driven, watershed-scale approach has been widely recognized as innovative and effective by the Bonneville Environmental Foundation, the Idaho Governor’s Office of Species Conservation, the National Fish and Wildlife Foundation, 1% for the Tetons, and many others. We are currently at a critical juncture for the Teton Watershed. At the same time that Friends of the Teton River and our partners are making huge strides in restoring the upper watershed, a rebuild of a dam on the lower river would decimate one of the last strongholds for the native Yellowstone cutthroat trout we have worked so hard to protect. At a time when we are making great progress in restoring habitat and removing barriers to trout migration in the upper watershed, we could lose one of the last truly wild river canyons in the Western U.S. Frriends of the Teton River and other conservation groups such as Trout Unlimited are building strong coalitions between previously antagonistic stakeholders, and finding new and effective water management strategies that support adequate water for both agriculture and a thriving native trout fishery. We have found time and again in the upper Teton watershed that a local community can work together to create a place where water supports a vibrant and diverse local economy. It is time for us to move forward, away from an era of dam-building, and toward an era of innovative solutions that meld ecology with economics, and that involve local communities in creating a sustainable future. We need your help. Please join us as we work together to make the entire Teton watershed a model for democratic, science-based watershed management. Give your support to Friends of the Teton River as we work closely with partners such as Trout Unlimited, Idaho Rivers United, American Rivers, the Henry’s Fork Foundation, and the Greater Yellowstone Coalition to ensure that the scope of the dam study is expanded to include innovative, stakeholder-derived, non-structural alternatives that meet actual, quantified water needs. Additionally, as the Bureau of Land Management (BLM) considers Wild and Scenic designation for reaches of the Teton River and its tributaries, Friends of the Teton River encourages you to share your input.